So, I've been focusing most of my home remodeling projects on the kitchen lately. You know when you get to a place where you just can't take the ugliness any longer or you're gonna scream? Ok, that was me. 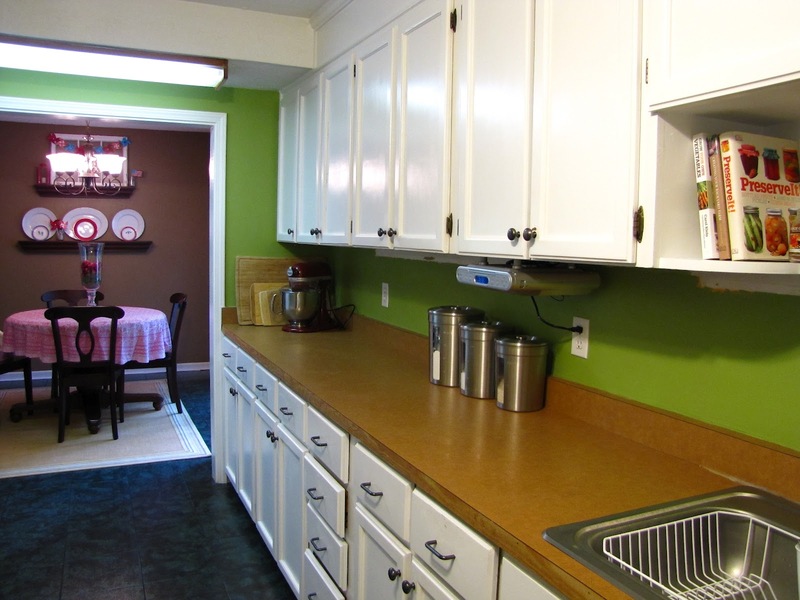 When we moved in, the kitchen was the absolute ugliest room in the house. And to make matters worse it's one of the first rooms you see when you walk in the front door. It should have been one of the first rooms I worked on but to tell you the truth I was intimidated by the amount of work and projects that I had never tackled before. The only natural light coming into this room is from the windows in the foyer and the large window all the way at the end in the breakfast room. It was starving for some brightness. I added the beadboard basksplash to lighten it up a bit. It never got completely finished because I knew before I attached the molding at the bottom I had to decide on what to do with the ugly counters. I got the idea to paint them several months ago while in Lowe's. I was in the caulking aisle trying to decide what type to get to finish up my backsplash project when this adorable little Spanish lady and her balding husband came up and started talking to me. They were the cutest little do-it-yourselfers ever! She went on and on about all the projects she had done and all the money they saved and even tried to tell me where she lived inviting me to come over and look at her house. I'm not all about knocking on strangers doors so I passed on that one. She said she had found some tile on sale for dirt cheap one day and they hated the color but loved the shape so they bought it and painted them. She said if you don't like something just imagine it in a different color and paint it! And that's when it hit me...I should paint those ugly counters!! 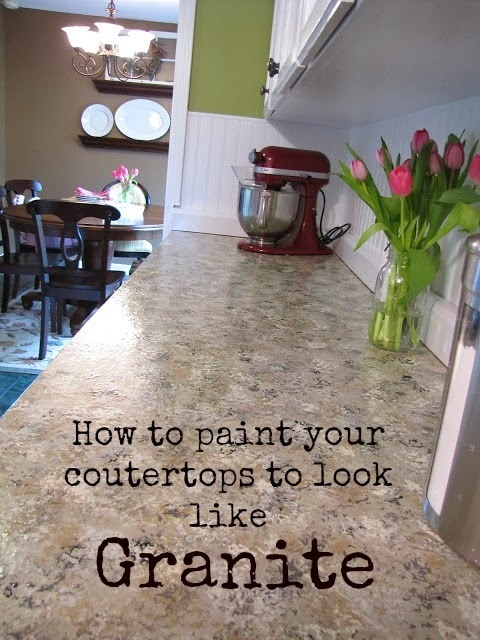 So I started researching painted countertops and to my surprise there was a ton of info on it! 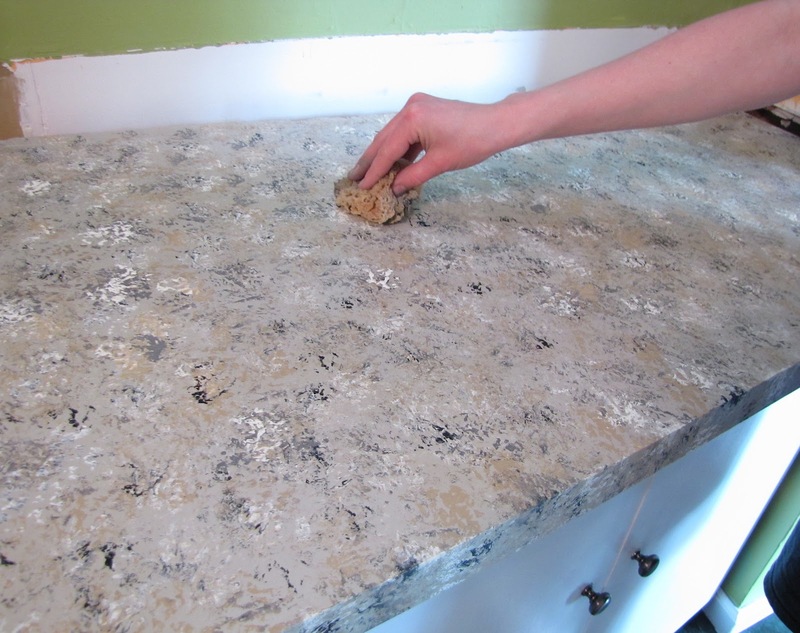 Lots of people had painted their countertops with great results! So I took the plunge. I was so nervous to start this project but I thought nothing I do could possibly be any uglier than it already was. So I did... and I failed! I mentioned in an earlier post about my epic failure and this was it. Now don't think I gave up or anything. 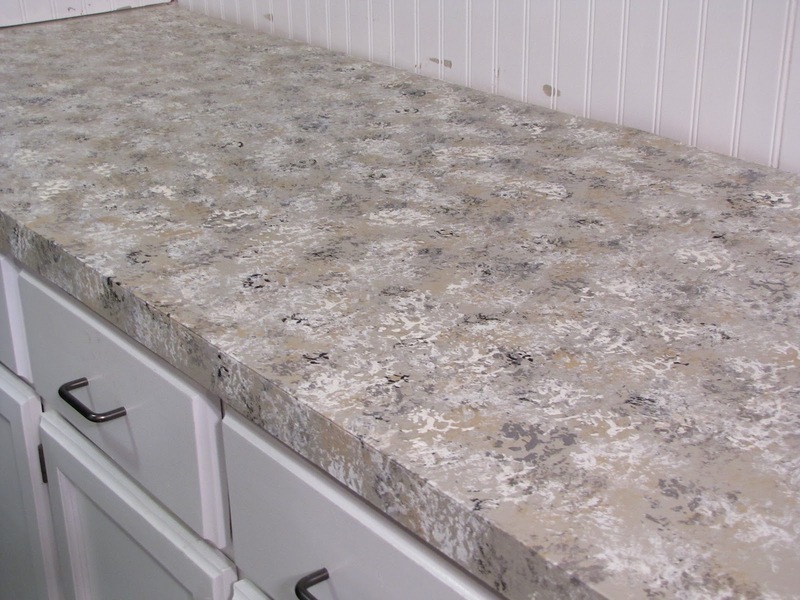 I was determined to have decent looking countertops if it killed me so I tried again and was very happy with the results! Here is a look at what they look like as of now. Please excuse the ugly floors... that's a project for another day! Here is a picture of the kitchen before the backsplash and counters. Wow, it looks even uglier in the photo than I thought! There was an entire piece missing off of the front of the counter that I replaced using a piece I salvaged from the backsplash. Here is my first attempt at the counters. 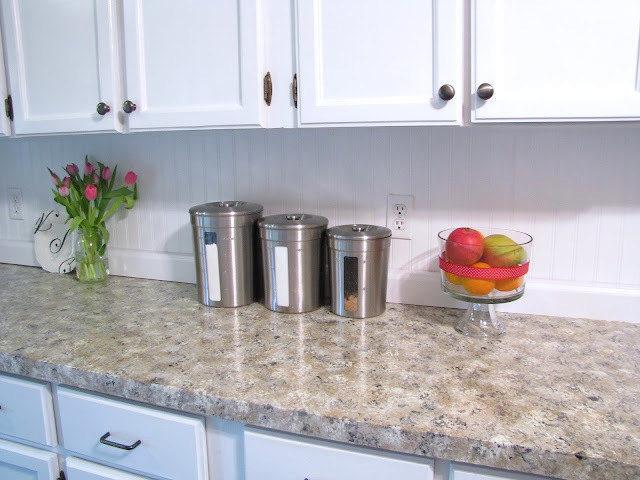 I found a tutorial where a lady had used scrunched up paper towels for her counter tops and they really turned out beautiful for her...just not for me. I didn't like the blotchiness that mine had when I used the paper towels. Back to the drawing board it was and I started all over. Here is how I came up with what I have now. 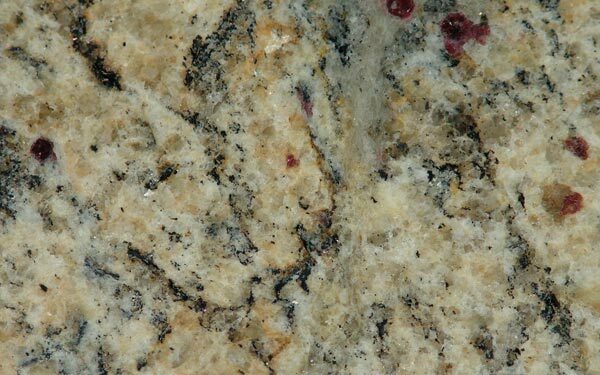 First, find a sample of granite that you like to use as a guide when painting your counters. Here are a few I found online. To prep the counters I cleaned them really well with soap and water. Then I let them fully dry and sanded them down. Wipe down the counter again with a wet rag to get all the dust off. Once it is dry prime the counters with two coats of primer. I used Rust-oleum's countertop paint as a base color and it says no primer is needed on the can but I had already primed my counters from the first time I painted them. 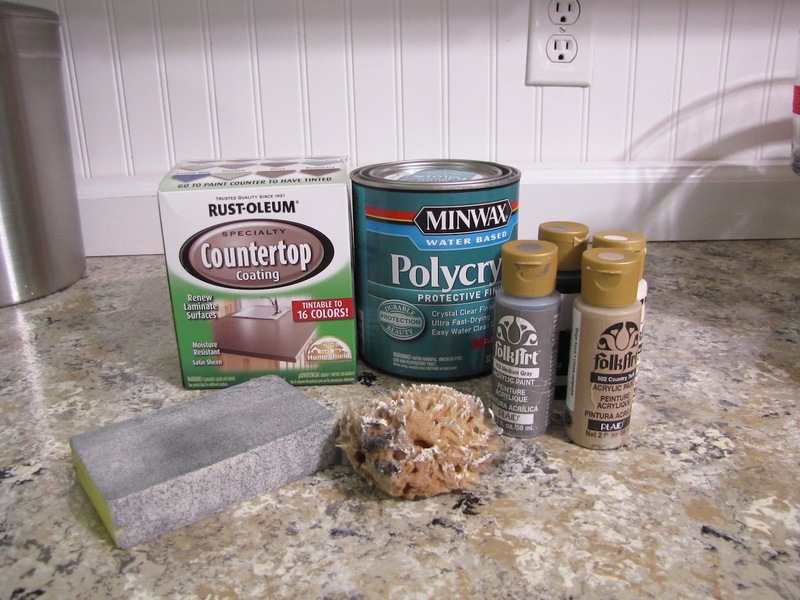 After the primer is dry you will do two coats of the countertop paint letting it dry a few hours in between each coat. Let me tell you this stuff STINKS! I opened all my windows, had two fans going and got the kids and Lily out of the house for a couple hours! Here is a look at what they looked like with the base paint color. Once you do this it takes two days to fully dry (although it dries to the touch in minutes). I waited one day and then used my sea sponge to start adding my other colors. I squirted a little bit of each color out onto a piece of cardboard and used that as my "artists pallet". I wet my sea sponge with water and then started dabbing on the paint using straight up and down motions. I didn't wait to let the paint dry in-between coats because I wanted the colors to be fully incorporated. I watched the Giani Granite video and that's what they did and since I was going for the same look I did it also. A look at the counter before the clear coat. 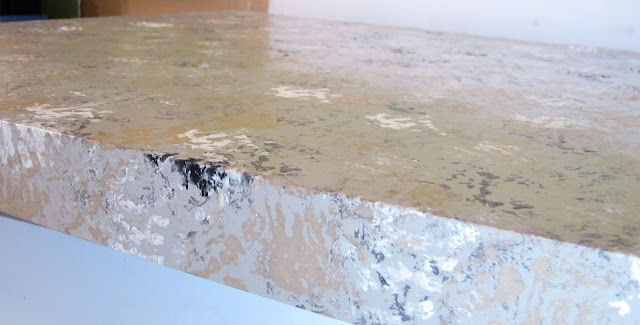 Here's a close-up of the edge of the counter. 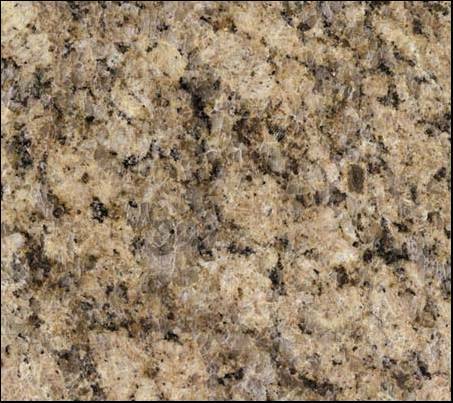 Since true granite goes through and through you want to use your sponge on the corners of the counter to make it look like it was cut straight through. I waited another day to let the paint fully dry and then, using a foam brush, I added the clear coats. After the first coat was dry I sanded it down lightly and wiped it down. After that I applied several other coats of the poly every one-two hours. I probably did around 8 or 9 coats total. I left it alone to dry for about 3 days before lightly using and waited about a week to put back on my heavy kitchen aid and canisters. As you can see I still have to attach and caulk the molding. I use soap and water for every day cleaning and vinegar to disinfect. 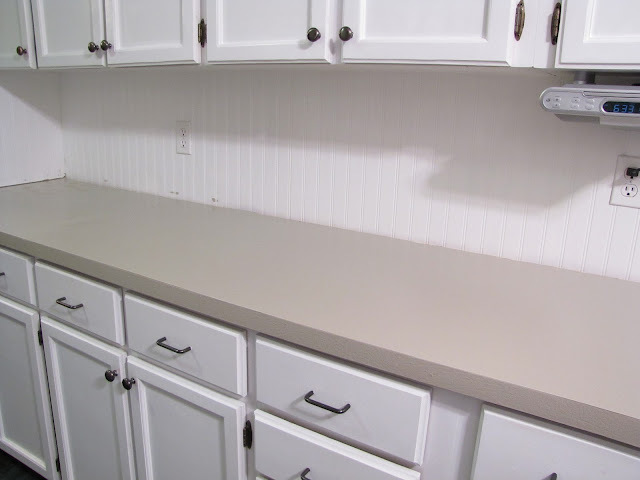 I only did one side of my counters at a time so that I wouldn't be totally without during this project. I'm working on the other side right now and once that is finished I'll add the beadboard backsplash and some open shelving. 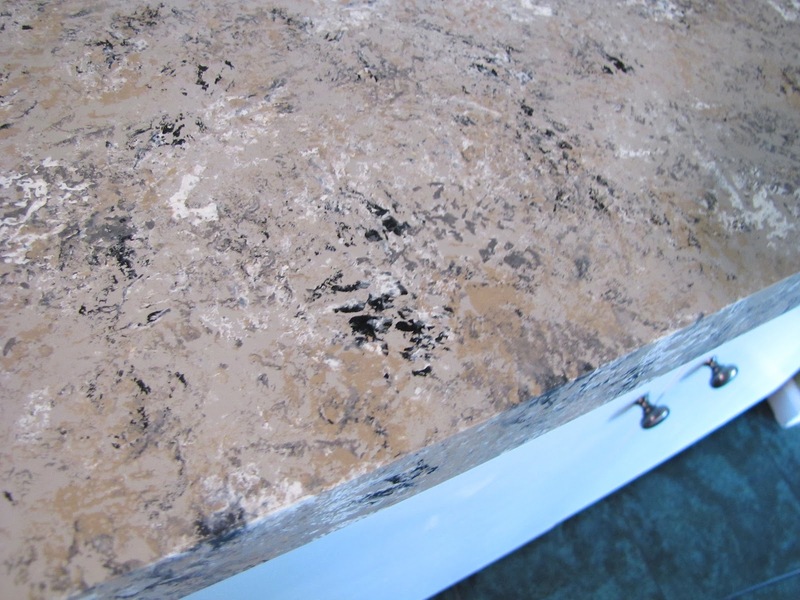 *Update: The countertop in these pictures have been finished for several weeks now and they are holding up perfectly. 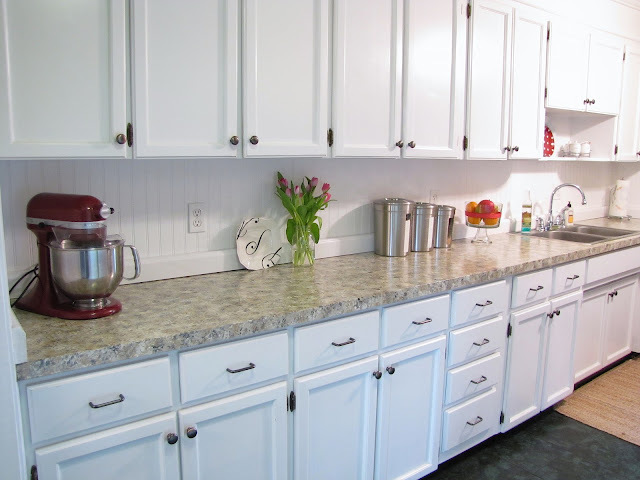 I had originally mentioned in this post that I didn't prime them before I painted on the Rustoleum countertop paint but I did however prime the counters in the very beginning from the first time I started this project. Remember my "epic failure". I had done them once and didn't like how they looked so I started all over. All that to say I did originally prime my countertops and am changing this post to reflect that. Linking up with a few of these wonderful parties. Check them out! At least I see it that way! Wow, what a transformation! That looks great. 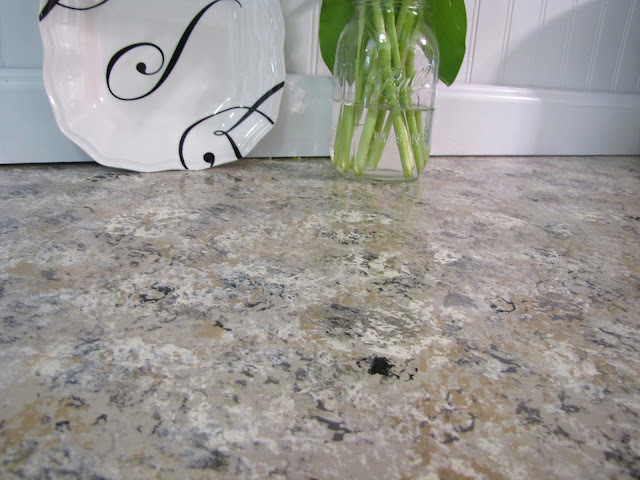 I really like your granite countertops! I have been wanting to do something like this for a long time. It would be nice to get something that doesn't stain and is easy to clean. Thanks! Your counters look amazing!! Its been quite a while since you posted this, how are they holding up? Do you remember how many bottles of acrylic paint you used? Thanks for the inspiration!! Thank you! They are holding up perfectly! Just make sure if you do this project to not forget to prime! I learned the hard way that all the little steps to prep for a paint job really do make a difference. I don't remember exactly how many. I think I started off with around 3 bottles of each of the different colors I used. I have really long counters so I may have had to go back for a couple more. Hope that helps! I have found that the polycrylic shows too much texture in the final finish even when using a roller for smooth surfaces. I also tried a brush but then got brush marks where it began to dry so quickly. I've been looking for a different product to use as a topcoat because of this. What did you use to apply the polycrylic to get the smooth finish? I want to try this. Not on a countertop but a desk top surface. I plan to use two layers of MDF sandwich together and filled and primed. Do you think this will work? It will just be the flat surface with no back splash. Hello! Yes I do think you could do it on MDF. Just make sure you prime really good first. And do the several coats of poly afterwards. I'm assuming you would just be doing light type work on the desk...not banging on it or anything. I use my counters everyday for food prep etc. so they do get a lot of use but I'm not doing hammering or anything like that on it otherwise I think they would chip. Hope that helps! I'd love to see how it turns out! 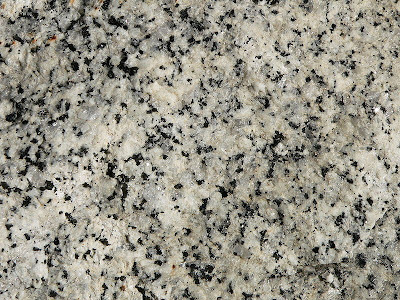 I am also try this at my new home granite is for long life...one should fix at once and remain rest of life no problem. This is a cool alternative to getting granite in Toronto. I'm probably still going to fork up the cash for real granite though, I like a smooth countertop. Looks fabulous! 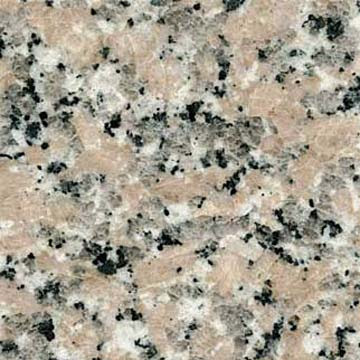 I'm in the process of doing 2 counters in my kitchen at the moment. I primed with white. Then using a sea sponge, I started with a light yellow or cream, then added light tan, medium tan, warm brown, and very little dark brown. Then took the light cream and softened up the brown a little. The result is making my kitchen brighter and I haven't added any polycrylic yet. Thanks for the before and after photos pertaining to the clear finish. I see the change and how it seems to really create the finished look that we all want. Thanks again. I used a foam brush and didn't have any streaking problems. I applied it quickly using back and forth strokes. Hope that helps!! Heather, they are holding up great! There is no peeling or cracking. The only problem I have had is a chip where I dropped a pretty heavy skillet on it. The corner of the skillet chipped the paint. It was pretty small so I just touched it up with the leftover paint I had and it's not noticable now. Thanks for reading! 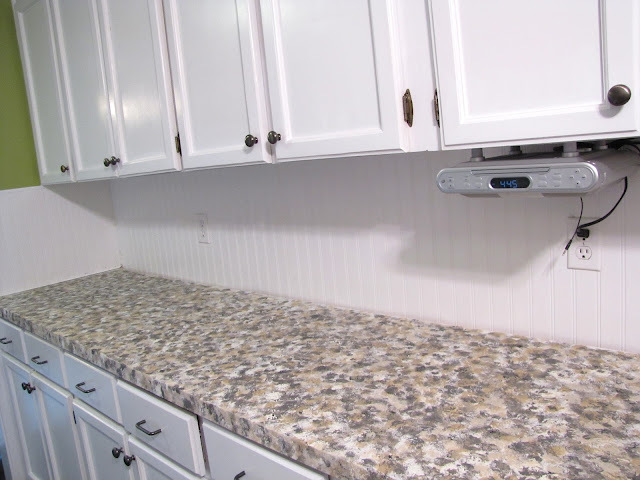 Hi I just found your site and wanted to find out how your counter tops have held up through the years. 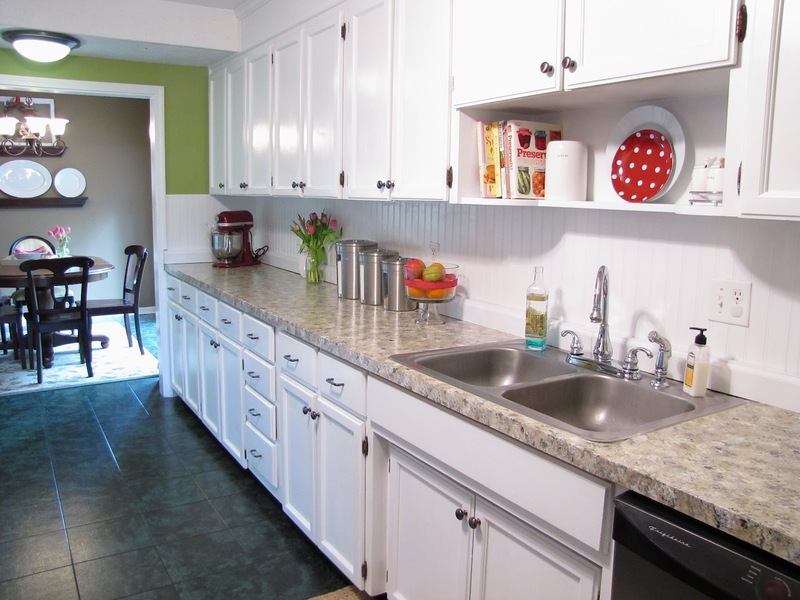 I actually have the very same ugly counter top you had and why I am looking to paint it. 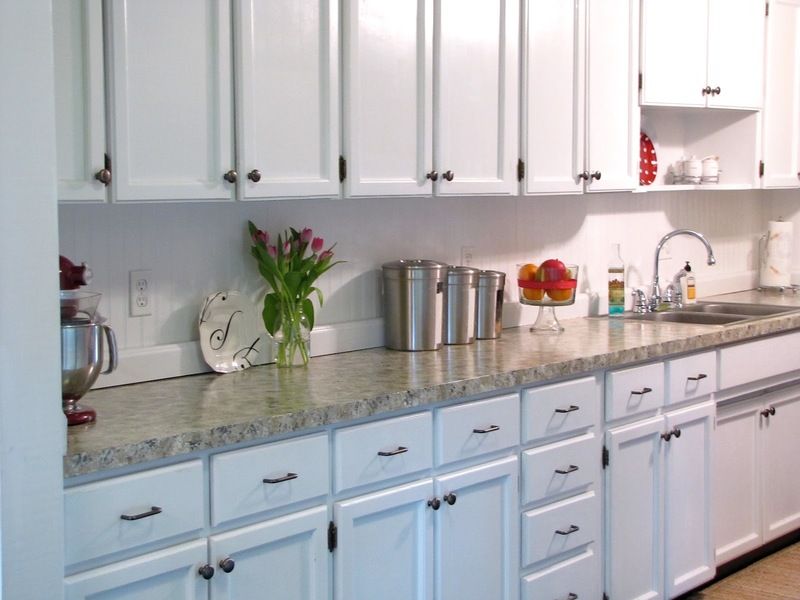 I want to redo my cabinets too and plan to put bead board back splash also but have to do something with the ugly counter tops first. So I would love to hear back from you on how well your project has held up for you.